“Life is O’erflowing with Beautiful Things. The link to hear the music and singing isPrimary Song “Life is O’erflowing With Beautiful Things….a good example is this beauty from the bird world! the kids hear the song. Then I would have pianist play it again and hold up pictures while singing the items the song talks about (blue skies, mountain, rainbows, fountains). You could just find pictures on the internet or in magazines and some you could just draw and color like the rainbow. Or if you are lazy like me then HERE is a flipchart from Primary Singing Time Ideas for Leaders. It is really cute! This would be a great song to prepare to sing in sacrament meeting for Thanksgiving. The 2nd verse could be sung by some of the older kids or a class of kids. That way you only have to teach the first and last verse and you could actually have the 4 sets of things listed on some poster paper and hold up as you sing the verses for the ward. It would be love-er-ly! We also visited the farm at Thanksgiving Point and saw lots of animals in the petting area. My grandkids loved it. It reminds me of “I Know Heavenly Father Loves Me” which is also a great song for Thanksgiving. They sang it in 4 part harmony at my baptism, a group of 4 friends of mine from my high school years. They all helped to convert me back in the days of high school in California. I still feel gratitude to all of them. You know who you are guys! If you want to do that one instead for Thanksgiving the flipchart for it is HERE at Primarily Singing’s blog. It is pretty cute too. 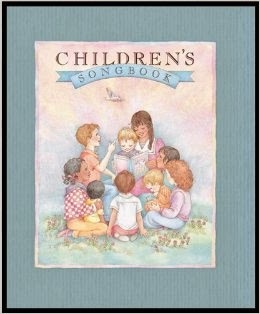 Primary Children’s Songbooks in paperback style. Another idea is to play NAME THAT TUNE. Give each group a small, paperback, Primary hymnbook. Then each group will pick a song that they know. They will go up and show the song to the pianist (bless her heart – this will be a tough week!). She’ll play it through and the rest of the Primary will flip through their books to see if they can find it. If they can’t guess the song, the group that picked the song will come up and hum the song. If the song still can’t be guessed, then that group will sing the song. Or you could play a fun play on words to the tune: IF YOU’RE HAPPY AND YOU KNOW IT. Change to Halloween words by writing them on the chalkboard or a poster board. We made these pumpkins in my classroom this week. You could hold up a picture of a Ghost, Cat, Skeleton, Monster and Witch as you go through the verses. This would be fun to do as a fun song for the next 2 weeks until Halloween! If you’re a ghost and you know it just say BOO. If you’re a monster and you know it say ROAR! I also found a Witch’s Hat party game you could play having a class of kids come up while you sing words to a song. The pianist stops the music as one of the kids is walking over the hat. They are out. Whomever is last wins in that class and gets a tootsie roll or sticker. Check it out HERE at Blackdog.net. They also have a printable witch hat. Or just bring one from home.